When you think of essential oils does the term aromatherapy come to mind? It is true that smelling essential oils is one of the more common ways people make use of them. In fact, in light of recent weather disasters in our country and around the world, I think aromatherapy is an excellent way to help with emotional trauma, and I wish more people would become aware of the benefits of aromatherapy. Have you ever considered the power of our sense of smell? It is a unique sense, in that the molecules we smell through our nose travel directly into the emotional part of the brain called the Limbic area. From there chemical messages are sent out to the rest of the body, by-passing the areas of the brain where thoughts happen. So aromatherapy is one of the fastest ways to benefit the body. Another way to use essential oils is topically. We often think about massage when talking about topical use. But I also have applied essential oils to an area of my body that is asking for some comfort. Many oils are soothing to the skin and even can be nourishing. Two that come to mind right are Lavender and Frankincense. A lesser known way to use essential oils is by ingesting them. This is probably one of the more controversial methods of using oils. But let’s think logically for a moment. Do you eat lemons? Do you use spices in your food? Do you like peppermint flavored foods? So if you answered yes to any of these questions, then why would you object to using essential oils that come from those plants internally? Here’s the thing that is imperative to remember for all these ways of using essential oils: They are VERY POTENT. Less is more. For example, did you know that one drop of pure peppermint essential oil is equal to 28 cups of peppermint tea? 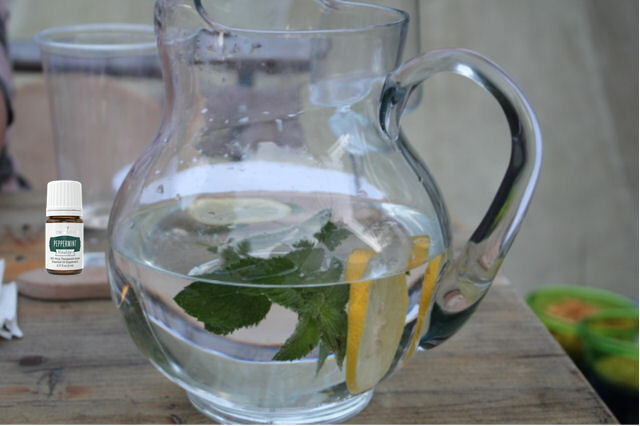 So if you want to add peppermint oil to your water to make a refreshing beverage, you might want to only dip a toothpick into your oil and then swirl it in your glass or stainless water bottle. Or perhaps add only one drop to a one-gallon glass pitcher. In our last article, we mentioned that not all oils are created equal, so it is extremely important to read your bottle labels to be sure they are safe to use internally. Young Living has an entire line of oils called “Vitality Oils” that are labeled and safe for internal consumption. Have some fun exploring the many choices and if you want more information about ways to use oils in your cooking, please contact me at Joyce@ShareScents.com.